Metric: Red hats. Preferably wide-brimmed. Sanbenitos came a close second but that would be an ecumenical matter. DISCLAIMER: Based on a true confess review copy provided by Open Design. The Inquisitor's Edge showcases the strengths of a versatile class. The 30 feats in this book have utility outside of the class and emphasise the inquisitor's unspoken strength as a team player. The builds display how good and evil characters alike can shine. The layout is overall good with a couple of minor slips. For the price, this is excellent value and recommended if you own the Pathfinder Advanced Player's Guide. Content: 4 red hats (strong feats, interesting builds). The introduction plays up the mystique of the class. The inquisitor is accessible, with elements of ranger, bard and cleric to it and strong offensive virtues. Describing the spell list as a utility belt infers plenty. The inquisitor is set up as a lone wolf. Paradoxically, the rest of the book showcases the strengths of the inquisitor as a team player. The concept of inquisitor as force multiplier with trickery gives the class a lot more substance beyond it's limited purview of 'find the evil, smite the evil'. A little more of this would have made the introduction sing. The feats cleave neatly along individual effectiveness/party teamwork lines. Here there are swashbuckler and manga elements. 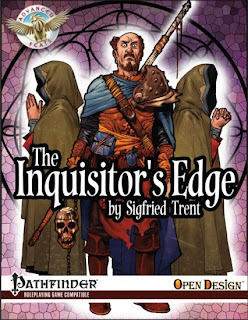 An excellent selection of feats and not just for inquisitors. Although some GMs may balk at feats like shared magic (perfect for mystic theurge types), others like defensive insight, ducking shot and fearsome will quickly be adopted. Particular gems include friend and foe (play 'good cop, bad cop'), fencing stance (concise yet effective) and fast track (vital for those urban chase sequences). The builds showcase the strengths of the inquisitor. The bloodhound is a strength-based half-orc tracker that focuses on the bring 'em back alive ethos. The wolf in sheep's clothing is a ranged half-elf intriguer who uses enchantment to ensnare people to darker deeds. The detective takes a couple of levels of monk before adding a liberal dash of Sherlock Holmes. What's missing though is the monster hunter, surprising given the inquisitor's roots in characters like Van Helsing or Parl Dro. Artwork & Layout: 4 red hats (nice layout, unexpected minor typography slips). Christophe Swal shows the inquisitor flanked by two praying acolytes. This reinforces the motif of power through co-operation even though the inquisitor is a strong lone wolf figure. Interior artwork is simple, ornate stained glass decorations help set mood. Some spelling and typeface slippage were surprising throwbacks to earlier releases. I'll bet that unforgiving release schedules are the culprit here. My only closing question is "Hey, Wolfgang, when's the compilation coming out?" The Advanced Feats series helped unpack the new classes in the Advanced Player's Guide, provided a load of new feats that expands options and a number of suggested builds for players to consider when creating their own. This is a prime example of a series that compliments the rule set and shows the virtues of open game licenses. Well have that compilation / print version as soon as it clears the papal office. :) We are hoping to have them in hand as we go conventioneering this summer. I am just now looking at the first batch of final art pieces from the fertile mind and agile hand of Mr. Swal. My apologies for the typographical errors, as you surmise, there was a bit of a rush at the end on this one, especially on the review copies. Fortunately those grabbing them from KQ or RPG.net should find fewer blemishes. Having done all the APG classes now, the my inner munchkin wants to play Summoner and my RP side loves inquisitor. All in all though, the more I dug into these classes, the more I liked all of them. Sigfried, thanks for taking time to respond to this review! Delighted by the news there will be a compilation this summer. My personal player choices are alchemist, witch and inquistor. I admit the idea of GM-ing a high-lvl summoner and multi-limbed eidolon fills me with some trepidation.